It is a given that a novice reviewer of the Sarajevo Film Festival (SFF) would saturate their audience with the facts that have more to do with Sarajevo’s recent history than with the growing importance of its biggest annual festival to the revival and integration of the regional film industry. But reporting from the SFF comes with an in-built artistic license for anyone whose antennae tune into the broader social significance of the event, so let me make my apologies first, and give you an explanation second. Turning film into a bit-part actor of the SFF is necessary when the festival’s mise en scène is the city that emerged out of the longest siege in the modern history only 11 years ago. In the centrifugal process of national disintegration, Sarajevo, once the geographical centre of the former Yugoslavia and its most interesting and contradictory cultural node, found itself devoured by the destructive forces of regional nationalism. There, more than at any other co-ordinate of the 1990s Balkan conflict, the potent rhetoric of the deluded ideologues of war delivered a direct attack on collective memory sealing it with the destruction of some of the most significant cultural landmarks, such as the city’s National Library. Sarajevans never bothered much with the semantics of war per se, which were largely in the hands of the perpetrator and the observers. But they did coin an expression that described the four years of psychological warfare with their pluralist cultural legacy as the attempted urbicide. Much has been written about the city’s spiritual resistance to urbicide, though not enough is known about it outside of the parameters of the Balkan cultural space. It began in 1992 with the establishment of the Sarajevo War Theatre (SARTR), which performed over 1000 times in the shelters of the besieged city, igniting a phenomenon that, in the words of an anonymous citizen, kept most Sarajevans from going insane. In a prolonged Godotesque moment of existential suspension, Sarajevans fed themselves with the only readily available war time ration – its art. Once they trained themselves to do so in shelters, they proceeded to emerge from their Underground (yes, Emir Kusturica is a native), with the fatalistic passion of the condemned. Like the protagonists of Kusturica’s films (and, one could argue, like Kusturica himself), they developed an offbeat aesthetic response to their reality reminiscent in all but name of the theatre of the absurd. Theirs was the reality of the absurd. And thence, amidst the chaos of the third year of the 1990s siege, the Sarajevo Film Festival was born. It is in the previous few paragraphs that you will find the explanation for the extraordinary involvement of Sarajevans with the SFF. There is a special connection between the festival founders, who are still at the helm, and devout local cinema goers, who greet each other with a wink of recognition honouring the time when attending festival screenings was literally a matter of life and death. This could also explain the unusual atmosphere around the festival’s red carpet – it is generally devoid of the admiring public with locals preferring to sip coffee in numerous cafes surrounding the main festival venues. Film – not celebrity worship – is on the menu, though you may get a standing ovation at the 2,500 seat Open Air cinema, one of the festival’s eleven screening points, if you’re Bono. Then again, Bono is an honorary citizen with a long-standing socio-political agenda. And Sarajevans are fond of socially engaged art and its prophets. It should come as no surprise, then, that out of some 170 films in 13 streams and three regional competition programs, they gave the Sarajevo Heart (audience choice for the best film of the festival), to Michael Winterbottom and Matthew Whitecross for their controversial 2006 “docufeature” The Road to Guantanamo. This year’s Berlin Festival runner up to Sarajevo’s own Jasmila Zbanic and her Austrian/Bosnian/Croatian/German co-produced debut Grbavica, The Road to Guantanamo is an unsentimental insight into a more recent realm of the absurd – the war on terror and the Guantamo Bay prison. Combining different media techniques, the story of Guantamo’s three youngest prisoners, the British-born Rhuel Ahmed, Asif Iqbal and Shafiq Rasul, is an exemplary piece of socially engaged cinematography created for popular impact. Using the televisual structure of a docudrama, the directorial duo (who previously collaborated in 2003 on Code 46 and in 2004 on 9 Songs) recreated the story of Ahmed, Iqbal and Rasul’s ultimate rite of passage that started with a trip to Punjab where Iqbal was to meet the woman whose hand in marriage was promised to his family, and ended with their two-year imprisonment in Guantamo Bay. Along the way, Winterbotton and Whitecross perform a masterful examination of the paranoid alienation creating the chasm in the contemporary world, presenting a story of the second generation Pakistani youth whose search for identity, meaning and adventure lands them in Afganistan, a kind of idealistic revolutionary space that the young European left of the 1960s would have found in Vietnam. In a Kafkaesque twist, their Afganistan adventure turns the three struggling teenagers into the face of global terror, depriving them not only of their right to innocence, but also of the very basic human rights the West is so dogmatically preaching to the rest of the world. The feature aspect of the film creates an atmosphere of credible horror, which is equally suspended and supported by its documentary element built around original war reports, hand camera usage, clever narration and the involvement of the real protagonists, the so-called “Tipton Three”. 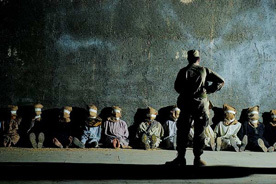 The technical and emotional interplay of the Winterbottom–Whitecross storytelling delivers an uncomfortable attack on the senses dragging the viewer into a simulated experience of the physiological and psychological degradation of the 500 or so Guantamo Bay prisoners, none of whom have yet been convicted on terrorism charges, at the hands of their US captors. It is a significant film, not only because of its treatment of the subject matter that is redefining some of the core tenets of the Western civilisation at present time, but equally because it practically demonstrates the endogenous aspect of the “clash of civilisations” problem by giving the disenfranchised party a voice, and changing the spotlight of the debate by forcing some self-insights on the reluctant Western audiences. Sarajevans, of course, intuitively recognised the film’s significance, having themselves been on the receiving end of some of the more delusional political decision-making of the twentieth century, which prevented them from defending themselves during the four years of siege. Socially engaged, in this instance, meant the ultimate emotional connection with the Tipton Three. The second most significant moment of the festival was probably the premiere of Danis Tanovic’s Hell, based on an idea by Polish film director Krzysztof Kieslowski and a screenplay by Krzysztof Piesiewicz, whose brilliant cast, including Emmanuelle Béart, Carole Bouquet, Guillaume Canet and Miki Manojlovic, easily convinced the SFF audience that Tanovic is already a mature filmmaker capable of a radical aesthetic departure from the ascetic signature of his 2001 Oscar-winning debut feature No Man’s Land. Hell is the second part of the late Kieslowski’s unfinished trilogy, Heaven, Hell, Purgatory, and a beautifully crafted alegorical piece that could be mistaken for the grand master’s own work if it wasn’t so faithful to Kieslowski that Tanovic’s own cinematographic subtility remains barely visible under his eagerness to do it justice. Reminiscent of Euripides’ Medea, Piesiewicz’ screenplay introduces a Freudian element to what, in every other aspect is almost a classical Greek text, exploring the recurring emotional cycles of family “scripts” of which children are the inevitable victims. Exquisite in its execution, Tanovic’s second film is an important exercise in stamping the regional talent pool with a refreshingly pure, if occasionally overdone emphasis on aesthetics, which has been missing from the resources-strapped and fragmented regional production over the last decade or so. It is due to this trend that The Transilvania International Film Festival director, Mihai Chirilov, called most of the competition selection of the 12th SFF “cheap”, reflecting on their poor production values, an overwhelming focus on social drama and a narrow thematic range built around the post-war and post-communist transition issues affecting the region. Yet, knowing that seven out of the nine authors, whose films were shown in the features competition program this year, were debutants clearly defines the SFF as the context in which the emerging regional talent announces their intention to tell their stories in a new and refreshing ways. It is unclear whether Gospodjica, the winner of the features competition program, can in fact be described as either new or refreshing. The festival couloirs were rife with speculation that it is the bias of the Festival Jury’s President, Jasmila Zbanic, rather than the quality of the winning feature that delivered the top award to another young woman – Andrea Staka. Like Zbanic’s own Grbavica, Gospodjica is a film about women that speaks about the deepest human connections, replacing the visual and dynamic aspect of “male” cinematography with the subtlety and simplicity of a strong dramaturgical approach. This may be an unfair charge, for Gospodjica delivers one of the strongest career performances of the regional acting doyen, Mirjana Karanovic, and is undoubtedly skillful in drawing strong emotional responses to the fate of the three female characters, Ruza, Ana and Mila, the representatives of three different generations, views and value systems of the former Yugoslav migrants in Switzerland. But alongside Cornelius Porumboiu’s 12:08 East of Bucharest, Miroslav Momcilovic’s clever and funny Seven and a Half, and especially Radu Muntean’s Paper Will Be Blue, all which can be charged with the equal neglect of form over content, Gospodjica does depart from the current regional trend in socio-political psychodrama, which seems to be holding the regional aesthetic preferences in the firm grip. The Festival’s Tribute program, which this year featured Abel Ferrara and Béla Tarr, and its Children’s Program continue to build the SFF’s strengths, and its easy ability to engage the filmmakers with the audience through moderated forums are certainly unique in their participative, democratising approach to a film industry event. Add some 1,000 regional and international attendees to the mix, and you’ll get the idea why the SFF is a rising star on the European festival circuit. Highly recommended.